Fig. 7-2-1-1 shows the number of repeat offenders cleared for non-traffic penal code offenses (refers to those who have been cleared for penal code offenses or special act offenses excluding Road Traffic Act violations; hereinafter the same in this subsection unless specified otherwise) and the rate of repeat offenders (refers to the percentage of repeat offenders among those cleared for non-traffic penal code offenses; hereinafter the same in this subsection) over the last 20 years (for repeat delinquencies by juveniles see Section 5 in this chapter). 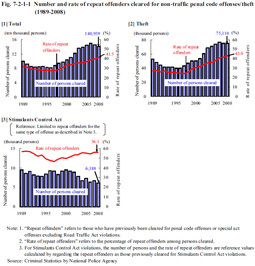 The number of repeat offenders cleared for non-traffic penal code offenses continued to increase from 1997 but decreased slightly for two consecutive years from 2007, and was 140,939 in 2008. The rate of repeat offenders continued to increase consistently from 1997 and was 41.5% in 2008. Basically the same trends were observed for theft, as the number of repeat offenders was 75,110 and the rate of repeat offenders 43.0% in 2008. For Stimulants Control Act violations the rate of repeat offenders is remarkably high when compared to those for non-traffic penal code offenses and theft. Due to limitations in the statistical data, however, the figures indicate reference values calculated by regarding the repeat offenders as having been previously cleared for violations of the said Act. The number of repeat offenders of Stimulants Control Act violations has generally followed a decreasing trend since 2001. The rate of repeat offenders, however, decreased from 56.9% in 1989 to 46.7% in 1997, but then turned to an upward trend, being 56.1% in 2008.